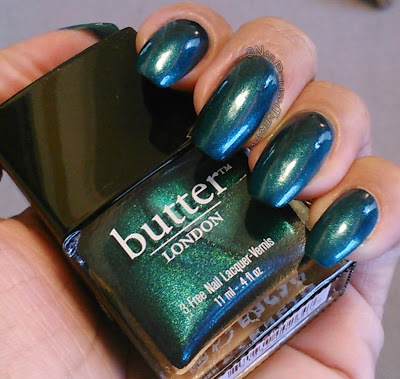 Butter London Part Deux, Butter London Part Deux, Alright ladies (and whatever lone gentlemen follow me) I'm cutting to the chase and bringing you four more Butter London beauties. These are a mix from my order online at Coterie (which I'll never order from again because it took forever) and the Ulta BOGO Butter London sale. Next week I will bring you the last part of the BLs I got during the sale. Warning this post contains LOTS of pics. I have to say I was not impressed with the formula on this one. It was runny, streaky, and too thin for my taste. With a color like this I expected a thicker formula. 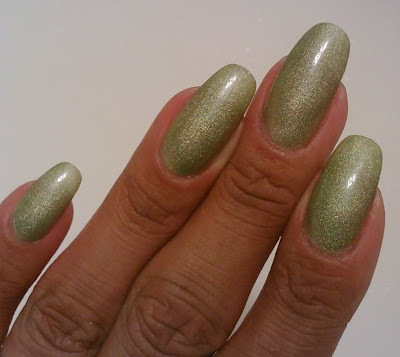 This is 3 coats without topcoat. 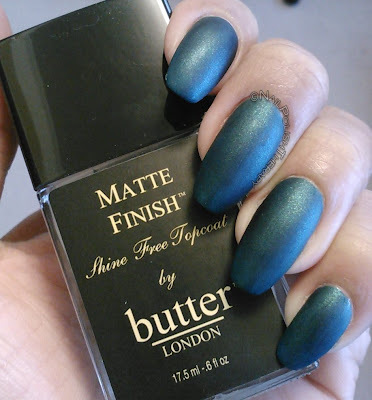 The color is beautiful and I almost left it shiny but I was anxious to see it with the BL Matte Topcoat. 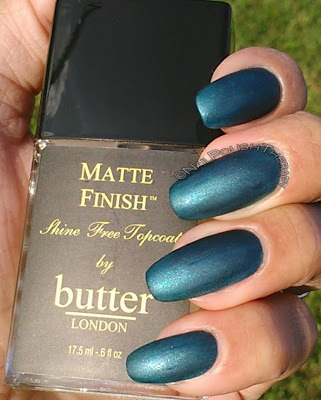 This is the best Matte Topcoat I have tried hands down! 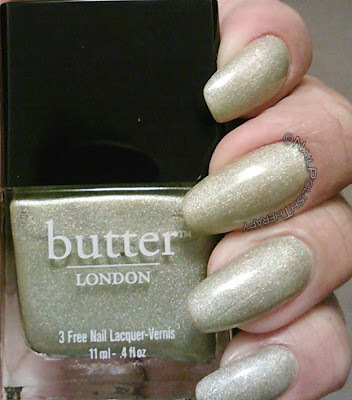 It is consistent and goes on evenly and leaves no streaks of the shiny polish underneath. In addition to that I was able to apply lotion on my hands and it still did not become shiny. That is not the case for the Hard Candy and Essie Matte Topcoats I've tried in the past. What is there to say about this milky white color? Um it's very classic, but it definitely had the same formula problems that Bluey. 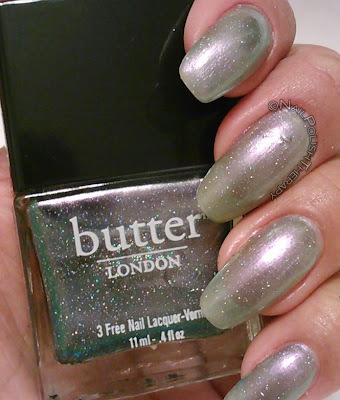 Maybe it was just my bottle, but it took me 3 coats for an even appearance. This has a true white base despite the slight pink cast to the color. Next time I will apply with a ridge filler and see if that makes a difference. Knackered is a topper as we say in the nail polish community. 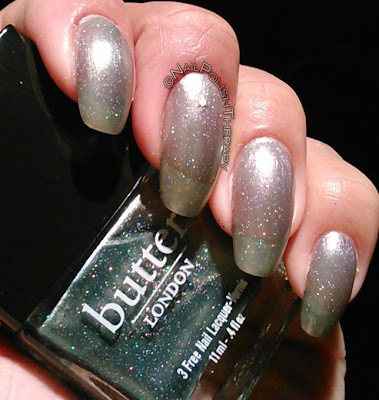 Its a duochrome with a clear base and silver glitter. It looks like the galaxy in the bottle to me. I could have put it over a black or white to showcase it better but I wanted to show the true color. The formula was much better on this one. It spread very evenly and I found the silver glitter to be not too much but just enough. 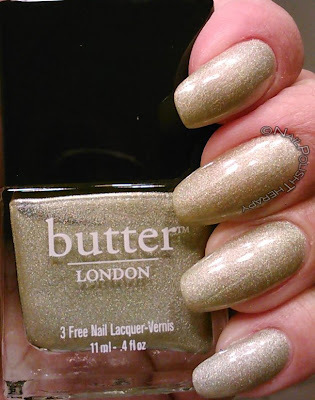 I have no idea what the reference is with the name of this polish but I was pleasantly surprised with this one. 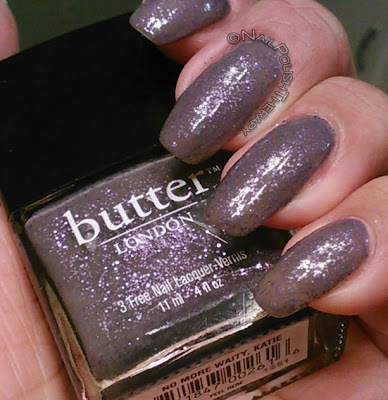 It's a taupe (slightly plum) sheer base with purple glitter. With three coats it built up nicely and like Knackered this polish was even in consistency as well. I didn't add a topcoat because I felt the texture was cool. This is a great conservative color with a slight edge. In the picture above you can barely make out the green tinge but I promise you this color is a light sage green. Try as I might, my camera would not photograph the green in the color. Check out the pictures below they are all practically gold. 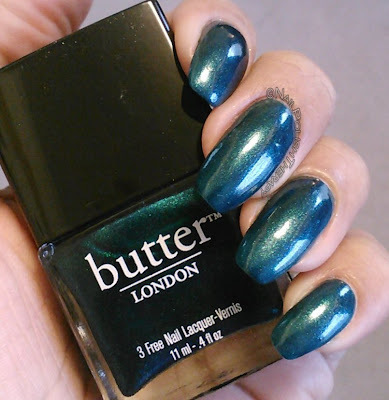 I swooned over this color when I first saw it on a fellow blogger on Pintrest and I had to have it. 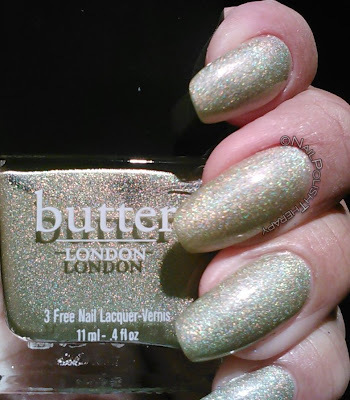 Trustafarian is a heavily pigmented light sage green with gold undertones and holograph glitter incorporated throughout. 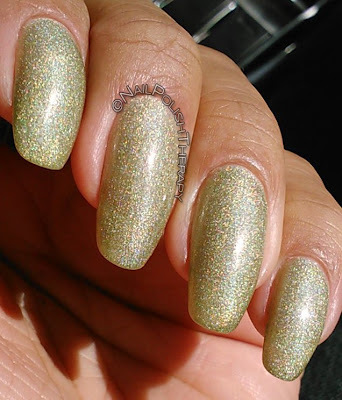 This is not your typical holo, but in the right light you can see that holo dancing all over the nail. I freakin' love this color! 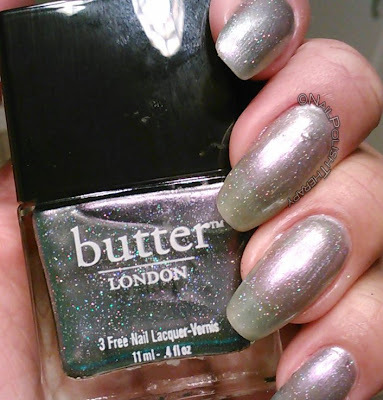 That concludes part deux of the Butter London haul. Thoughts? Feelings? Concerns?